Patience was of major importance for the producers of ‘Planet Parrot’, when shooting hatching macaws in Mexico – but in the end, everything was worth the wait. 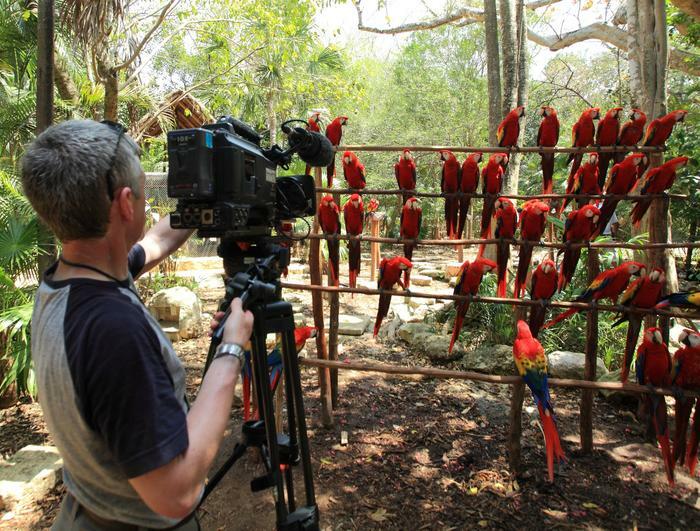 In April, Graham Horder and I travelled to Mexico’s Yucatan Peninsular to film at a scarlet macaw breeding centre for ‘Planet Parrot’. One of our goals was to show the bizarre, human world into which these endangered birds hatch. Many begin their life in an incubator in the corner of a dark, humid breeding room. However, to film the hatching itself took a lot more effort than we expected. When Graham and I arrived, there were two eggs in the incubator. Only one of them was due to hatch during our visit. We had to be careful not to miss it. At eleven o’clock one morning, we were called over to see the small, star shaped crack that had appeared in the egg. We were told to expect the chick to emerge anytime in the next 12-24 hours. With lights and camera poised for action, our vigil began. 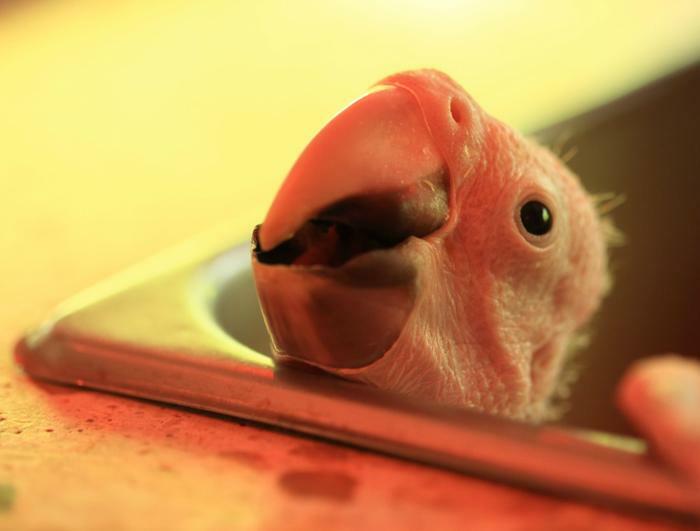 The breeding room was full of macaw chicks aged between a few days and three months old. It was kept at 36°C and over 90 percent humidity, accompanied by loud squawks and the sickly stench of fresh parrot droppings. An occasional, violent jerk from the egg maintained our enthusiasm during the first twelve hours. However, as night set in, we began to watch in shifts. Over the following night and day, one of us monitored the egg while the other got some sleep or fresh air. At 5am on the second night, the egg finally hatched. It had taken an incredible 40 hours to do so. 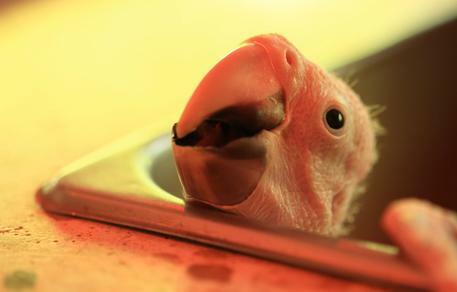 However, to film the first moments of a macaw chick’s 60-year life made the wait worthwhile. 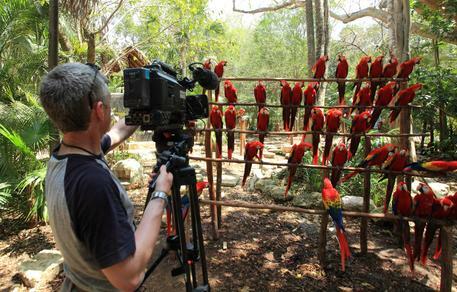 Cameraman Graham Horder filming some of the 1000 Adult scarlet macaws bred at the Experencias Xcaret breeding centre. A 2 week old scarlet macaw chick in the breeding room at Experencias Xcaret. Follow this link to read more about the production, watch a trailer or the whole film, or read on here for another story from behind the scenes of ‘Planet Parrot’.